Chicago Handyman can handle your small electrical jobs. There are a few instances where electrical work in Chicago is permitted without a permit or a licensed electrician. At Chicago Handyman we take these guidelines very seriously. Nothing is more important than the safety and soundness of your property. We have a licensed union electrician on call for just such occasions. Here are just some of the Electrical projects we can handle. If you do not see your project listed, please contact us. Ceiling Fan Installation – A ceiling fan can be one of your greatest allies when it comes to home energy efficiency. Proper air flow creates an even temperature through out the building. 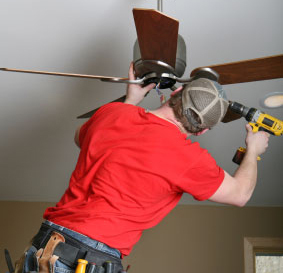 Chicago Handyman can recommend and install ceiling fans for your home or office. Light Switches and Outlets – When its time to upgrade your light switches to dimmers give us a call. A dimmer switch can range from $5-50+ and there is a difference in quality. the lower priced dimmers tend to stick more, and be less responsive. The higher end switch will have fast response time and some are equipped with motion sensors, to turn lights off when the room is not in use, adding yet another notch in your utility savings. Low Voltage Wiring – Audio/visual, Security systems, Network cables, home automation – these are just a few of the projects we enjoy. We can even create artistic gaming stations using your device cables as our paintbrush. 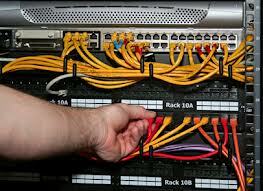 Perhaps you prefer discreet running of wires so everything is clean and modern. It matters to us, so please talk to your technician and let us help you manifest your vision. When its time for small project electrical work, Chicago Handyman has you covered. Our licensed electricians are ready for those large scale projects. We offer free estimates for all projects big or small. And a haircut guarantee. If you don't like our hair cut, we guarantee that our electrical work is something you will like.